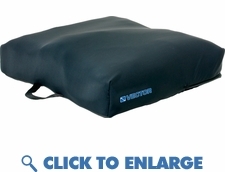 Vector Advanced Care Cushion: The Vector custom air cushion provides pressure relief while promoting proper alignment. Fully adjustable air compartments provide a custom fit. Rear middle compartment allows deep immersion, keeping the user from sliding forward. Air cells may be added or removed from medial thigh separator to stabilize the patient. Elevated side compartments run from front to back to provide lateral support for pelvis and thighs. Ideal for treatment of advanced pressure sores.